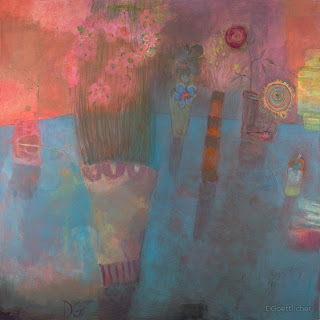 Join us for our reception with Pennsylvanian artist Diane Goettlicher, where you will have the opportunity to view her work over a glass of bubbly. Goettlicher’s paintings are dramatic and evocative, she uses the lazure technique to create richly textured and colorful canvases. She experiments with monotype and printmaking as she meditates on public and private subjects. Political protest, calla flowers and the signifiers of domestic routine are all at home in her compositions. Not to be missed!